"Coup" and "Counter-coup" redirect here. For other uses, see Coup (disambiguation), Coup contrecoup injury, and Coup d'état (disambiguation). Although the concept of a coup d'état has featured in politics since antiquity, the phrase is of relatively recent coinage;  the Oxford English Dictionary identifies it as a French expression meaning a "stroke of state". The phrase did not appear within an English text before the 19th century except when used in translation of a French source, there being no simple phrase in English to convey the contextualized idea of a "knockout blow to the existing administration within a state". 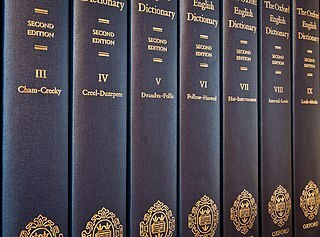 The Oxford English Dictionary (OED) is the principal historical dictionary of the English language, published by Oxford University Press. It traces the historical development of the English language, providing a comprehensive resource to scholars and academic researchers, as well as describing usage in its many variations throughout the world. The second edition, comprising 21,728 pages in 20 volumes, was published in 1989. Wool is the textile fiber obtained from sheep and other animals, including cashmere and mohair from goats, qiviut from muskoxen, from hide and fur clothing from bison, angora from rabbits, and other types of wool from camelids; additionally, the Highland and the Mangalica breeds of cattle and swine, respectively, possess wooly coats. Wool consists of protein together with a few percent lipids. In this regard it is chemically quite distinct from the more dominant textile, cotton, which is mainly cellulose. The Morning Chronicle was a newspaper founded in 1769 in London, England, and published under various owners until 1862, when its publication was suspended, with two subsequent attempts at continued publication. From 28 June 1769 to March 1789 it was published under the name The Morning Chronicle, and London Advertiser. From 1789 to its final publication in 1865, it was published under the name The Morning Chronicle. It was notable for having been the first steady employer of essayist William Hazlitt as a political reporter, and the first steady employer of Charles Dickens as a journalist; for publishing the articles by Henry Mayhew that were collected and published in book format in 1851 as London Labour and the London Poor; and for publishing other major writers, such as John Stuart Mill. Napoléon Bonaparte was a French statesman and military leader who rose to prominence during the French Revolution and led several successful campaigns during the French Revolutionary Wars. He was Emperor of the French as Napoleon I from 1804 until 1814 and again briefly in 1815 during the Hundred Days. Napoleon dominated European and global affairs for more than a decade while leading France against a series of coalitions in the Napoleonic Wars. He won most of these wars and the vast majority of his battles, building a large empire that ruled over much of continental Europe before its final collapse in 1815. He is considered one of the greatest commanders in history, and his wars and campaigns are studied at military schools worldwide. Napoleon's political and cultural legacy has endured as one of the most celebrated and controversial leaders in human history. There was a report in circulation yesterday of a sort of coup d'état having taken place in France, in consequence of some formidable conspiracy against the existing government. 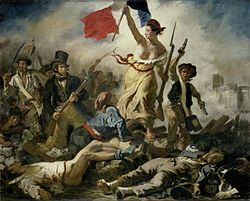 The French Revolution was a period of far-reaching social and political upheaval in France and its colonies beginning in 1789. 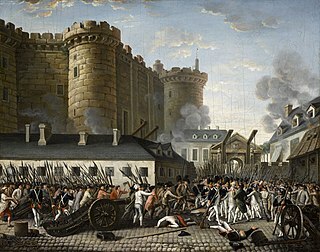 The Revolution overthrew the monarchy, established a republic, catalyzed violent periods of political turmoil, and finally culminated in a dictatorship under Napoleon who brought many of its principles to areas he conquered in Western Europe and beyond. Inspired by liberal and radical ideas, the Revolution profoundly altered the course of modern history, triggering the global decline of absolute monarchies while replacing them with republics and liberal democracies. Through the Revolutionary Wars, it unleashed a wave of global conflicts that extended from the Caribbean to the Middle East. Historians widely regard the Revolution as one of the most important events in human history. A gendarmerie or gendarmery is a military component with jurisdiction in civil law enforcement. The term gendarme is derived from the medieval French expression gens d'armes, which translates to "armed people". In France and some Francophone nations, the gendarmerie is a branch of the armed forces responsible for internal security in parts of the territory with additional duties as a military police for the armed forces. This concept was introduced to several other Western European countries during the Napoleonic conquests. In the mid twentieth century, a number of former French mandates or colonial possessions such as Lebanon, Syria, and the Republic of the Congo adopted a gendarmerie after independence. Louis Antoine de Bourbon, Duke of Enghien was a relative of the Bourbon monarchs of France. More famous for his death than for his life, he was executed on charges of aiding Britain and plotting against France. Royalty across Europe were shocked and dismayed at his execution. Tsar Alexander I of Russia was especially alarmed, and decided to curb Napoleon's power. In looser usage, as in "intelligence coup" or "boardroom coup", the term simply refers to gaining a sudden advantage on a rival. Notable counter-coups include the Ottoman countercoup of 1909, the 1960 Laotian counter-coup, the 1965–66 Indonesian mass killings, the 1966 Nigerian counter-coup, the 1967 Greek counter-coup, and the 1971 Sudanese counter-coup. ↑ Monarch who overthrew his father in a bloodless palace coup. ↑ Subsequently confirmed by a narrow margin in the 2009 Mauritanian presidential election, which was deemed "satisfactory" by international observers. ↑ De facto Prime Minister at that time, but under court order to resign. ↑ Hadi resigned on 22 January 2015. ↑ Mugabe resigned on 21 November 2017. A civil war, also known as an intrastate war in polemology, is a war between organized groups within the same state or country. The aim of one side may be to take control of the country or a region, to achieve independence for a region or to change government policies. The term is a calque of the Latin bellum civile which was used to refer to the various civil wars of the Roman Republic in the 1st century BC. Modification of an existing constitution. An ethnic conflict is a conflict between two or more contending ethnic groups. While the source of the conflict may be political, social, economic or religious, the individuals in conflict must expressly fight for their ethnic group's position within society. This final criterion differentiates ethnic conflict from other forms of struggle. An alliance is a relationship among people, groups, or states that have joined together for mutual benefit or to achieve some common purpose, whether or not explicit agreement has been worked out among them. Members of an alliance are called allies. Alliances form in many settings, including political alliances, military alliances, and business alliances. When the term is used in the context of war or armed struggle, such associations may also be called allied powers, especially when discussing World War I or World War II. Democratization is the transition to a more democratic political regime, including substantive political changes moving in a democratic direction. It may be the transition from an authoritarian regime to a full democracy, a transition from an authoritarian political system to a semi-democracy or transition from a semi-authoritarian political system to a democratic political system. Conflict resolution is conceptualized as the methods and processes involved in facilitating the peaceful ending of conflict and retribution. Committed group members attempt to resolve group conflicts by actively communicating information about their conflicting motives or ideologies to the rest of the group and by engaging in collective negotiation. Dimensions of resolution typically parallel the dimensions of conflict in the way the conflict is processed. Cognitive resolution is the way disputants understand and view the conflict, with beliefs, perspectives, understandings and attitudes. Emotional resolution is in the way disputants feel about a conflict, the emotional energy. Behavioral resolution is reflective of how the disputants act, their behavior. Ultimately a wide range of methods and procedures for addressing conflict exist, including negotiation, mediation, mediation-arbitration, diplomacy, and creative peacebuilding. The People's Redemption Council (PRC) was a governmental body that ruled Liberia during the early 1980s. It was established after the 1980 Liberian coup d'état wherein Samuel Doe seized power on 12 April 1980. The Council, with Doe as its chairman, promised a complete overhaul of Liberia's society, economy, and political system and the replacement of the corruption of previous regimes with respect for the rights of the Liberian people. The PRC had 17 founding members and was later expanded to 28. The PRC initially functioned as the executive and legislative body in Doe's government. However, over time Doe consolidated power as a central executive. In 1984, the PRC was dissolved and replaced by the Interim National Assembly. The 1973 Chilean coup d'état was a watershed moment in both the history of Chile and the Cold War. 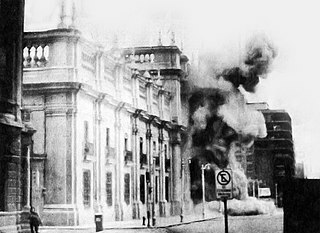 Following an extended period of social unrest and political tension between the opposition-controlled Congress of Chile and the socialist President Salvador Allende, as well as economic warfare ordered by US President Richard Nixon, Allende was overthrown by the armed forces and national police. The resource curse, also known as the paradox of plenty, refers to the paradox that countries with an abundance of natural resources, tend to have less economic growth, less democracy, and worse development outcomes than countries with fewer natural resources. There are many theories and much academic debate about the reasons for, and exceptions to, these adverse outcomes. Most experts believe the resource curse is not universal or inevitable, but affects certain types of countries or regions under certain conditions. Militarized interstate disputes (MIDs) are conflicts between states that do not involve a full-scale war. A conflict is described as an MID if it causes fewer than 1,000 deaths, and some military force is used. This can be as little as a military display of force with no deaths. Under this definition, over 2,000 MIDs have been identified since 1816 in the Correlates of War project. "Long Peace" is a term for the unprecedented historical period following the end of World War II in 1945 to the present day. The period of the Cold War (1945–1991) was marked by the absence of major wars between the great powers of the period, the United States and the USSR. First recognized in 1986, such a period of "relative peace" between major powers has not been documented in human history since the Roman Empire. James D. Fearon is the Theodore and Francis Geballe Professor of Political Science at Stanford University; he is known for his work on the theory of civil wars, international bargaining, war's inefficiency puzzle and audience costs. According to a 2011 survey of International Relations scholars, Fearon is among the most influential International Relations scholars of the last twenty years. The United States has been involved in a number of foreign interventions throughout its history. There have been two dominant schools of thought in America about foreign policy, namely interventionism and isolationism which either encourage or discourage foreign intervention respectively. Conflict trap is a term to describe the pattern when civil wars repeat themselves. Despite its popular usage, anocracy lacks a precise definition. Anocratic regimes are loosely defined as part democracy and part dictatorship, or as a "regime that mixes democratic with autocratic features". Another definition classifies anocracy as "a regime that permits some means of participation through opposition group behavior but that has incomplete development of mechanisms to redress grievances". Scholars have also distinguished anocracies from autocracies and democracies in their capability to maintain authority, political dynamics, and policy agendas. Similarly, these regime types have democratic institutions that allow for nominal amounts of competition. In the 1994 Gambian coup d'état, a group of soldiers led by 29-year-old Lieutenant Yahya Jammeh seized power in a bloodless coup d'état on the evening of 22 July, ousting Dawda Jawara, who had been President of the Gambia since its independence in 1970. A Soft coup, sometimes referred to as a Silent coup, is a coup d'état without the use of violence, but based on a conspiracy or plot that has as its objective the taking of state power by partially or wholly illegal means, in order to facilitate an exchange of political leadership - and in some cases also of the current institutional order. The October 1977 Thai coup d'état was a bloodless military coup which took place in Thailand on 20 October 1977, staged by the Royal Thai Armed Forces (RTAF). The coup was carried out under the nominal authority of Admiral Sangad Chaloryu of the Royal Thai Navy, head of the National Administrative Reform Council (NARC), but it was effectively led by General Kriangsak Chamanan of the Royal Thai Army, Supreme Commander of the RTAF. It led to the deposition of Prime Minister Thanin Kraivichien, who assumed the office following the 1976 coup d'état, in the immediate aftermath of the Thammasat University massacre. 1 2 3 4 5 6 7 Powell, Jonathan M.; Thyne, Clayton L. (1 March 2011). "Global instances of coups from 1950 to 2010 A new dataset". Journal of Peace Research. 48 (2): 249–259. doi:10.1177/0022343310397436. ISSN 0022-3433. ↑ "Banque de dépannage linguistique – état". Office québécois de la langue française. Archived from the original on 1 July 2012. Retrieved 12 December 2012. ↑ "coup d'état". Archived from the original on 15 September 2015. Retrieved 12 January 2019. ↑ "coup d'état". Archived from the original on 6 November 2015. Retrieved 12 January 2019. ↑ "Definition of COUP D'ÉTAT". www.merriam-webster.com. ↑ Norfolk Chronicle, 13 August 1785: "It is thought here by some, that it is a Coup d'Etat played off as a prelude to a disagreeable after-piece. But I can confidently assure you, that the above-mentioned arret was promulgated in consequence of innumerable complaints and murmurs which have found their way to the ears of the Sovereign. Our merchants contend, that they experience the greatest difficulties in trading with the English". ↑ Kleine Zürcher Verfassungsgeschichte 1218–2000 (PDF) (in German). Zurich: State Archives of the Canton of Zurich. 13 September 2000. p. 51. ↑ Pfeifer, Wolfgang (31 January 1993). Etymologisches Wörterbuch des Deutschen[Etymological Dictionary of German] (in German) (second ed.). Berlin: Akademie Verlag. ISBN 978-3050006260. ↑ "Röhm-Putsch" (in German). Deutsches Historisches Museum (DHM), German Historical Museum. Retrieved 26 March 2016. ↑ Todd Little-Siebold, "Cuartelazo" in Encyclopedia of Latin American History and Culture, vol. 2, p. 305. New York: Charles Scribner's Sons 1996. ↑ Luttwak, Edward (1979). Coup d'État: A Practical Handbook. Harvard University Press. ISBN 978-0-674-17547-1. 1 2 3 4 5 6 7 8 Derpanopoulos, George; Frantz, Erica; Geddes, Barbara; Wright, Joseph (1 January 2016). "Are coups good for democracy?". Research & Politics. 3 (1): 2053168016630837. doi:10.1177/2053168016630837. ISSN 2053-1680. ↑ Miller, Michael K. (1 October 2016). "Reanalysis: Are coups good for democracy?". Research & Politics. 3 (4): 2053168016681908. doi:10.1177/2053168016681908. ISSN 2053-1680. ↑ Thyne, Clayton (25 March 2015). "The impact of coups d'état on civil war duration". Conflict Management and Peace Science. 34 (3): 0738894215570431. doi:10.1177/0738894215570431. ISSN 0738-8942. ↑ Varol, Ozan O. (7 November 2017). The Democratic Coup d'État. Oxford University Press. ISBN 9780190626020 – via Amazon. 1 2 Belkin, Aaron; Schofer, Evan (1 October 2003). "Toward a Structural Understanding of Coup Risk". Journal of Conflict Resolution. 47 (5): 594–620. doi:10.1177/0022002703258197. ISSN 0022-0027. ↑ Bell, Curtis (17 February 2016). "Coup d'État and Democracy". Comparative Political Studies. 49 (9): 0010414015621081. doi:10.1177/0010414015621081. ISSN 0010-4140. ↑ "Democracy and Development". Cambridge University Press. Retrieved 23 February 2016. ↑ Hiroi, Taeko; Omori, Sawa (1 February 2013). "Causes and Triggers of Coups d'état: An Event History Analysis". Politics & Policy. 41 (1): 39–64. doi:10.1111/polp.12001. ISSN 1747-1346. ↑ Harkness, Kristen A. (1 June 2016). "The Ethnic Army and the State Explaining Coup Traps and the Difficulties of Democratization in Africa". Journal of Conflict Resolution. 60 (4): 587–616. doi:10.1177/0022002714545332. hdl:10023/9391. ISSN 0022-0027. ↑ Johnson, Jaclyn; Thyne, Clayton L. (26 June 2016). "Squeaky Wheels and Troop Loyalty How Domestic Protests Influence Coups d'état, 1951–2005". Journal of Conflict Resolution. 62 (3): 597–625. doi:10.1177/0022002716654742. ISSN 0022-0027. ↑ Wig, Tore; Rød, Espen Geelmuyden (1 August 2016). "Cues to Coup Plotters Elections as Coup Triggers in Dictatorships". Journal of Conflict Resolution. 60 (5): 787–812. doi:10.1177/0022002714553106. ISSN 0022-0027. ↑ Houle, Christian (1 September 2016). "Why class inequality breeds coups but not civil wars". Journal of Peace Research. 53 (5): 680–695. doi:10.1177/0022343316652187. ISSN 0022-3433. ↑ Piplani, Varun; Talmadge, Caitlin (1 December 2016). "When War Helps Civil–military Relations Prolonged Interstate Conflict and the Reduced Risk of Coups". Journal of Conflict Resolution. 60 (8): 1368–1394. doi:10.1177/0022002714567950. ISSN 0022-0027. ↑ Miller, Michael K.; Joseph, Michael; Ohl, Dorothy (26 May 2016). "Are Coups Really Contagious? An Extreme Bounds Analysis of Political Diffusion". Journal of Conflict Resolution. 62 (2): 410–441. doi:10.1177/0022002716649232. ISSN 0022-0027. ↑ Gassebner, Martin; Gutmann, Jerg; Voigt, Stefan (1 December 2016). "When to expect a coup d'état? An extreme bounds analysis of coup determinants". Public Choice. 169 (3–4): 293–313. doi:10.1007/s11127-016-0365-0. hdl:10419/156099. ISSN 0048-5829. ↑ Florea, Adrian (18 August 2017). "Spatial Rivalry and Coups Against Dictators". Security Studies. 0: 1–26. doi:10.1080/09636412.2017.1360072. ISSN 0963-6412. ↑ Arbatli, Cemal Eren; Arbatli, Ekim (2014). "External threats and political survival: Can dispute involvement deter coup attempts?". Conflict Management and Peace Science. 33 (2): 115–152. doi:10.1177/0738894214545956. 1 2 Lundgren, Magnus (2018). "Backdoor peacekeeping: Does participation in UN peacekeeping reduce coups at home?". Journal of Peace Research. 55 (4): 508–523. doi:10.1177/0022343317747668. 1 2 Nordvik, Frode Martin (2018). "Does Oil Promote or Prevent Coups? the Answer Is Yes". The Economic Journal. 129 (619): 1425–1456. doi:10.1111/ecoj.12604. ISSN 1468-0297. ↑ Böhmelt, Tobias; Escribà-Folch, Abel; Pilster, Ulrich (2018-08-13). "Pitfalls of Professionalism? Military Academies and Coup Risk" (PDF). Journal of Conflict Resolution. 63 (5): 002200271878974. doi:10.1177/0022002718789744. ISSN 0022-0027. ↑ T., Quinlivan, James (1 January 2000). "Coup-Proofing". www.rand.org. Retrieved 20 January 2016. ↑ Powell, Jonathan (1 December 2012). "Determinants of the Attempting and Outcome of Coups d'état". Journal of Conflict Resolution. 56 (6): 1017–1040. doi:10.1177/0022002712445732. ISSN 0022-0027. ↑ Braithwaite, Jessica Maves; Sudduth, Jun Koga (1 January 2016). "Military purges and the recurrence of civil conflict". Research & Politics. 3 (1): 2053168016630730. doi:10.1177/2053168016630730. ISSN 2053-1680. ↑ Narang, Vipin; Talmadge, Caitlin (31 January 2017). "Civil-military Pathologies and Defeat in War". Journal of Conflict Resolution. 62 (7): 1379–1405. doi:10.1177/0022002716684627. ↑ Bausch, Andrew W. (3 February 2017). "Coup-proofing and Military Inefficiencies: An Experiment". International Interactions. 0 (ja): 1–32. doi:10.1080/03050629.2017.1289938. ISSN 0305-0629. ↑ Leon, Gabriel (1 April 2014). "Soldiers or politicians? Institutions, conflict, and the military's role in politics". Oxford Economic Papers. 66 (2): 533–556. CiteSeerX 10.1.1.1000.7058 . doi:10.1093/oep/gpt024. ISSN 0030-7653. 1 2 Frantz, Erica; Stein, Elizabeth A. (4 July 2016). "Countering Coups Leadership Succession Rules in Dictatorships". Comparative Political Studies. 50 (7): 935–962. doi:10.1177/0010414016655538. ISSN 0010-4140. ↑ "Will Turkey's coup attempt prompt others nearby?". Washington Post. Retrieved 30 July 2016. ↑ Böhmelt, Tobias; Ruggeri, Andrea; Pilster, Ulrich (1 April 2017). "Counterbalancing, Spatial Dependence, and Peer Group Effects*". Political Science Research and Methods. 5 (2): 221–239. doi:10.1017/psrm.2015.55. ISSN 2049-8470. ↑ Easton, Malcolm R.; Siverson, Randolph M. (2018). "Leader survival and purges after a failed coup d'état". Journal of Peace Research. 55 (5): 596–608. doi:10.1177/0022343318763713. 1 2 3 Thyne, Clayton L.; Powell, Jonathan M. (1 April 2014). "Coup d'état or Coup d'Autocracy? How Coups Impact Democratization, 1950–2008". Foreign Policy Analysis: n/a. doi:10.1111/fpa.12046. ISSN 1743-8594. ↑ Derpanopoulos, George; Frantz, Erica; Geddes, Barbara; Wright, Joseph (1 April 2017). "Are coups good for democracy? A response to Miller (2016)". Research & Politics. 4 (2): 2053168017707355. doi:10.1177/2053168017707355. ISSN 2053-1680. ↑ Zack Beauchamp (16 July 2016). "Why Turkey's coup failed, according to an expert". Vox . Retrieved 16 July 2016. ↑ "Are coups good for democracy?". Washington Post. Retrieved 17 July 2016. ↑ "Jay Ulfelder on Twitter". 2016-07-16. Retrieved 17 July 2016. ↑ Bleck, Jaimie; Michelitch, Kristin (9 May 2017). "Capturing the Airwaves, Capturing the Nation? A Field Experiment on State-Run Media Effects in the Wake of a Coup". The Journal of Politics. 79 (3): 873–889. doi:10.1086/690616. ISSN 0022-3816. ↑ Shannon, Megan; Thyne, Clayton; Hayden, Sarah; Dugan, Amanda (1 October 2015). "The International Community's Reaction to Coups". Foreign Policy Analysis. 11 (4): 363–376. doi:10.1111/fpa.12043. ISSN 1743-8594. 1 2 Soest, Christian von; Wahman, Michael (1 January 2015). "Not all dictators are equal: Coups, fraudulent elections, and the selective targeting of democratic sanctions". Journal of Peace Research. 52 (1): 17–31. doi:10.1177/0022343314551081. ISSN 0022-3433. 1 2 Masaki, Takaaki (1 March 2016). "Coups d'État and Foreign Aid". World Development. 79: 51–68. doi:10.1016/j.worlddev.2015.11.004. ↑ Powell, Jonathan; Lasley, Trace; Schiel, Rebecca (7 January 2016). "Combating Coups d'état in Africa, 1950–2014". Studies in Comparative International Development. 51 (4): 482–502. doi:10.1007/s12116-015-9210-6. ISSN 0039-3606. 1 2 3 Thyne, Clayton; Powell, Jonathan; Parrott, Sarah; VanMeter, Emily (15 January 2017). "Even Generals Need Friends". Journal of Conflict Resolution. 62 (7): 1406–1432. doi:10.1177/0022002716685611. ↑ "Twenty Years Later: The Tajik Civil War And Its Aftermath". Radio Free Europe/Radio Liberty. 26 June 2017. Retrieved 9 March 2019. ↑ Al Jazeera News (11 April 2019). "Sudan's military seizes power from President Bashir". Al Jazeera News. Retrieved 11 April 2019. Singh, Naunihal. 2014. Seizing Power: The Strategic Logic of Military Coups. Johns Hopkins University Press. Malaparte, Curzio (1931). Technique du Coup d'État (in French). Paris. Finer, S.E. (1962). The Man on Horseback: The Role of the Military in Politics. London: Pall Mall Press. p. 98. Goodspeed, D. J. (1962). Six Coups d'État. New-York: Viking Press Inc.
Connor, Ken; Hebditch, David (2008). How to Stage a Military Coup: From Planning to Execution. Pen and Sword Books Ltd. ISBN 978-1-84832-503-6. McGowan, Patrick J. (2016). "Coups and Conflict in West Africa, 1955-2004". Armed Forces & Society. 32: 5–23. doi:10.1177/0095327X05277885. McGowan, Patrick J. (2016). "Coups and Conflict in West Africa, 1955-2004". Armed Forces & Society. 32 (2): 234–253. doi:10.1177/0095327X05277886. Beeson, Mark (2008). "Civil–Military Relations in Indonesia and the Philippines". Armed Forces & Society. 34 (3): 474–490. doi:10.1177/0095327X07303607. n'Diaye, Boubacar (2016). "How Not to Institutionalize Civilian Control: Kenya's Coup Prevention Strategies, 1964-1997". Armed Forces & Society. 28 (4): 619–640. doi:10.1177/0095327X0202800406.